Scott’s second installment examines the famous rock itself and souvenirs over the years. “In 1741, when a wharf was to be built, a 94-year-old Church Elder named Thomas Faunce identified the precise rock his father had told him was the first solid ground the Pilgrims set foot on. (However, the Pilgrims had actually first landed near the site of modern Provincetown on the tip of Cape Cod in November 1620 before moving to Plymouth). Later in 1774, the townspeople of Plymouth decided to move the rock. The rock split into two halves, and it was decided to leave the bottom portion behind at the wharf and relocate the top half to the town's meeting house. In 1859, the Pilgrim Society began building a Victorian canopy designed by Hammatt Billings around a part of Plymouth Rock. Later, iron gates were added to stop souvenir hunters. Following the canopy’s completion in 1867, the top of the rock was moved from Pilgrim Hall back to its original spot at the wharf. At that time, the date ‘1620’ was carved into the rock. 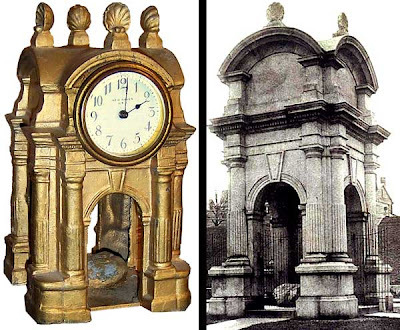 Miniature souvenir versions of the original 1867 canopy are very rare as it was torn down prior to the 1920’s. Made as either a paperweight or clock, it is an outstanding piece made in 1893 for the Pilgrim Society by Edesmad F.C. Co. located in Plymouth Mass. A roman columned portico canopy was designed by McKim, Mead and White and currently protects Plymouth Rock. As for then famous rock itself, there are many souvenir versions of it from ceramic to pot metal and even glass. Plymouth gift shops continue the souvenir trend with resin copies. It is interesting to note that during the rock's many journeys throughout the town of Plymouth, numerous pieces of the Rock were taken, bought and sold. So, it’s possible to have a souvenir of the real rock. Currently, Plymouth Rock is managed by the Department of Conservation and Recreation for the Commonwealth of Massachusetts as part of Pilgrim Memorial State Park. From May to Thanksgiving Day, Pilgrim Memorial is staffed by Park Interpreters who inform visitors of the history of Plymouth Rock and answer questions. So, during your next visit to Plymouth, be sure not only to check out the gift shops, but the real Plymouth Rock as well.” – Scott.